Messerschmitt Bf 109’s of II./JG53 undergo routine maintenance at Charleville-Mézières, Northern France, during the summer of 1940. With the Battle of Britain at its height the German fighters will soon be back in action over the Channel and southern England. 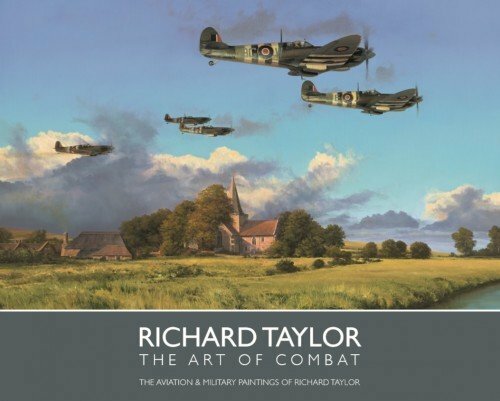 Each book in the portfolio is personally signed by the artist Richard Taylor. Major ERICH RUDORFFER Knights Cross with Oak leaves and Swords Serving throughout the whole of World War II during the Battle of Britain, the Eastern Front, north Africa, in the Defence of the Reich he flew Me109’s and Fw190's and finished flying the iconic Me262 jet. In more than 1000 combat missions, he ended the war as the seventh highest scoring Aces in history with 222 victories.